Kick Off : 2.30 p.m.
With only a week to go to the Bundesliga season, this was a tough match for Spurs, being a couple of weeks off their own start, but it was a competitive match, with some good quality football from both sides that ended in a draw and gave Martin Jol the opportunity to try out some new formations. The game ended up a little flat, although there were openings until the end, but there was enough in it, played in front of 38,500 fans, to keep the crowd entertained. Right from the start, there were opportunities, with Nelson Valdez bringing a fine save from Robinson, who pushed his drive over the top. From the corner, the ball found it's way out to Steven Pienaar, whose cross required Robbo to move his feet quickly to tip that over the crossbar. Tottenham's response was a Danny Murphy free-kick on 16 minutes, which was played into the area and with everyone missing it, the ball ended up in the net, but despite everyone thinking Spurs had taken the lead, the goal was ruled out with Benoit Assou-Ekotto being given offside. Another dead-ball situation saw Spurs go close with Jermaine Jenas firing a free-kick just over the bar and then Aaron Lennon, in his first first team start of the pre-season, played Keane in, but the Irishman hit his shot into the side-netting. 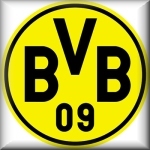 Murphy was in the mood and hit a fierce drive that Weidenfeller had to push out and then it was Dortmund on the attack, with Valdez putting Alexander Frei in on goal, but his shot was blocked by Dawson's timely intervention. Frei was not to be denied for long though, as three minutes later, he was the man who stepped up to take a free-kick from the edge of the box that left Paul Robinson grasping at thin air as the ball arrowed in just inside his post. So, it was 1-0 to Dortmund in the 36th minute. Spurs were playing quite comfortably up until the goal and were then chasing the game, hitting back with Young-Pyo Lee going close and then Danny Murphy spied Weidenfeller off his line, so produced a delicate chip that dropped agonisingly over the bar for all the Lilywhites in the crowd. In similar fashion to the home goal, three minutes after that escape, Spurs punished Dortmund with an equaliser. Dimitar Berbatov picked up a pass on the left side of the pitch and set off on a run and finished with a powerful low drive to beat the keeper across him, after he had tricked his way past two defenders. There was some complaint form the Dortmund players as they felt there had been a foul on Brzenska, but it was a classy striker's finish and one we all hope to see repeated in the Premier League soon. With Berbatov's strike coming just before the break, there was little time for much more action and the second half was a more sedate affair with substitutions breaking any flow in the game. Straight after the restart Phillipe Degen (who was linked to a move to Spurs recently) put in a fine cross for Valdez to rise and head goalwards from a central position, but his effort did not even hit the target. With 25 minutes left, Robbie Keane found himself with his back to goal, but managed to hook the ball goalwards and the ball once more dropped onto the top of the crossbar. as far as Spurs supporters were concerned. As the changes were made, Defoe came on to partner Berbatov, then the Bulgarian went off to leave Keane and Defoe up front. All the permutations will give Jol some variations to employ in the UEFA Cup should he need them. As the game entered the final stages, Defoe put a ball into Keane at the far post, but he fired over and Odonkor put Lars Ricken in when his shot brought a fine low stop out of Robbo at the foot of his left hand post. With Didier Zokora operating in front of the back four, he showed that he is a solid player, but I am sure there will be more to come from him when he has played a few more games with the rest of the team. Jenas looked lively, as did Lennon and the various partnerships up front demonstrated that they will be a force to reckon with when they get into the real action. With the game ending our 100% pre-season record, it was a little disappointing but with the draw, we showed that there is a willingness to go forward to recover a deficit, which can only bode well for the season ahead.